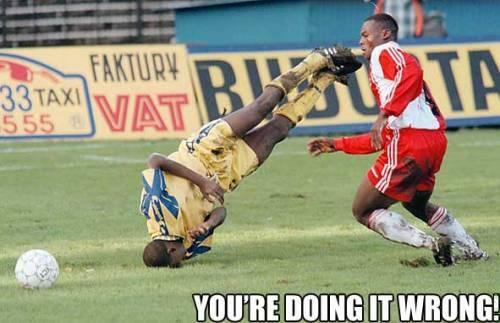 A big thanks to Avatar[DJedi] for finding this video on wegame.com. It captures some damning evidence between the difference of real hitboxes vs. visible player models. This could possibly be tweaked with some client-side prediction and interpolation settings, hopefully someone else will figure out the commands to fix the issue. Wow, while looking through a bunch of videos this weekend I ran across this little video. It shows how easy it is to hack the models in TF2 by only using notepad to change a few bytes to make every model show up as a wire frame. I’m sure Valve will have a fix out for this soon, but the simplicity behind this hack makes you wonder how many other blatant holes are in Valve’s game code. Looks like valve made the same mistake they did with Gravelpit and left some holes in the map that allow people to fall under the floor and build sentries. 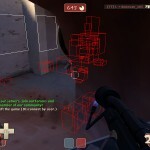 Here’s a vide from TF2 Exploit Blog that shows the exploit in it’s full glory. I would expect another team roomba video soon. Looks like players have once again done something Valve could never have predicted. I expect a fix for Dustbowl to be out in one of the upcoming patches. Unusual place for a Sentry Gun. As demonstrated at the end, although the window framing does seem solid, the windows themselves appear to be completely without physics. 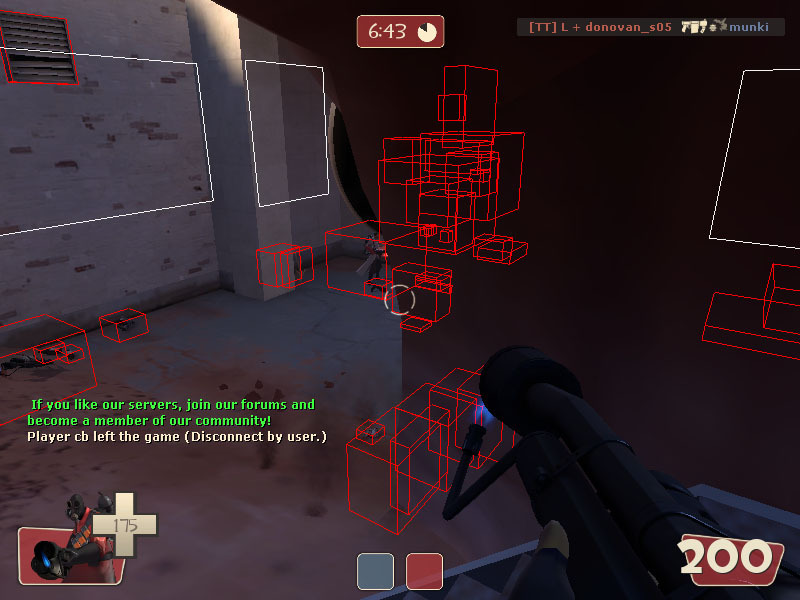 Someone named Antti found a hack built directly into the TF2 engine that allows you to wall hack and see wireframe outlines of the items you can’t see on the screen by using the included “Occlusion Tool”. Wikipedia has a good definition of what Occlusion is. In computer graphics, the term is used to describe the manner in which an object closer to the viewport masks (or occludes) an object further away from the viewport. In the graphics pipeline, a form of occlusion culling is used to remove hidden surfaces before shading and rasterizing take place. According to the poster, currently, you won’t get banned by using this exploit on VaC servers. With the flurry of hacks released recently I really hope valve does something to curb the usage of these cheats.